Sharing IT knowledge, One Post At A Time. In order to resolve this error, ensure that the creation of the virtual machine folder and resource pool is enabled in the virtual lab configuration. As a result, I have now logged this issue with Veeam as a product bug. Update: Veeam have now confirmed this is a bug in version 6.1 Patch 1. I recently experienced an issue with a Microsoft Exchange 2010 Database Availability Group (DAG) failing over during a Veeam Backup & Replication job. The issue was occurring due to the snapshot committal process in VMware, which causes a brief pause in virtual machine I/O. This pause was causing the DAG member to lose sight of the file share witness, which in this case was housed on the customer CAS server, and subsequently fail over. 3. Once the command has completed please run the following and ensure that the CrossSubnetDelay and CrossSubnetThreshold are set to 4000 and 10. 4. Re-run your Veeam backup job and see if the cluster fails over. If the backup completes correctly you can they reduce the CrossSubnetDelay and CrossSubnetThreshold to find the optimum values. I recently attended the VMware Install, Manage and Configure course for vSphere 4.0. As a part of the course I was introduced to Veeam’s FastSCP client. 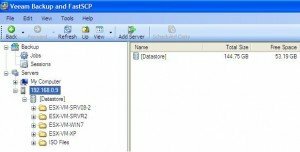 Veeam FastSCP is a freeware program that allows you to manage your ESX / ESXi host’s datastores. The application provides you with an easy to use Windows Explorer like interface that supports drag and drop functionality between hosts and from your desktop computer. This is functionality is particularly handy when uploaded ISO files or when taking a copy of a VMDK file. 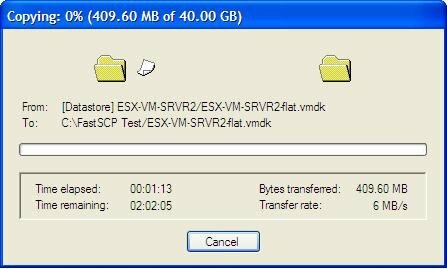 One thing I found before being introduced to Veeam’s FastSCP is how frustrating slow it is when copying files to and from datastores using the Datastore Browser in the vSphere client, I’m sure you’ll agree it’s a pretty painful experience when transferring large files over a 100 megabit network for example. For this reason I thought I would give FastSCP a try, especially when the vendors website claims it is up to six times faster than the traditional datastore browser. After installing the software and adding my ESXi host, which was achieved by simply hitting the “Add Server” button, I was now able to browse my datastore in full. How much quicker is FastSCP though? 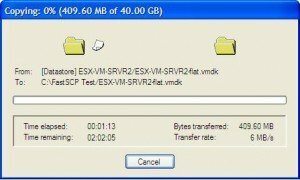 Well to test I am going to demonstrate the copy of a 40 gigabyte VMDK file from my datastore to a laptop computer running over a standard 100 megabit connection. This should give a good idea of any real speed advantages. First up I tested the time using the datastore browser to download the VMDK file, here is the estimated download time. As you can see the total estimated time is 333 minutes, which is the equivalent of 5 hours and 56 minutes. Next up was testing the download of the same VMDK with Veeam’s FastSCP. As you can see with FastSCP the estimated time is 2 hours and 2 minutes, which is the equivalent of 122 minutes in total. 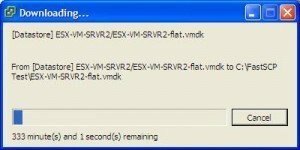 By comparing both of these times, we can see it will take 211 minutes longer by using the datastore browser to copy the VMDK file. That’s a massive 3 hours and 31 minutes longer compared to FastSCP. © 2019 B4Z.co.uk. All rights reserved.